Ski resort Klínovec is the largest skiing area in Krušné Hory mountains, with the transportation capacity of 25 130 people per hour. It is located only 120 km north-west from Prague and 100 km from Plzeň. 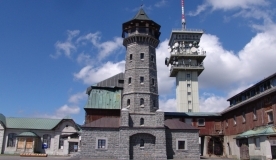 It lies close to the borders with Germany and the resort Oberwiesenthal. It traditionally offers excellent snow conditions throughout the season on 31,4 km of downhill skiing slopes of different difficulty and the area of 74 hectares of which 70% are provided with technical snow.